BISHKEK (24.kg news agency, Irina Dudka) – Iran stands ready to invest over US $10 billions in Kyrgyzstan and to resume direct flight to Tehran. The Kyrgyz Ministry of Finance reports following results of the meeting between the Kyrgyz Finance Minister Akylbek Zhaparov and the Iranian Minister of Industry, Mines and Trade Mehdi Ghazanfari (مهدی قضنفری). Iran mainly exports clothing, nuts, paints and flooring to Kyrgyzstan and imports meat, grain and steel scraps. According to Iranian Finance Minister, the previously signed preferential trade agreement could be turned into a free trade agreement by the two sides to enhance the two-way trade. 180 industrial units are currently operating in Kyrgyzstan. Negotiations were held during a visit of Akylbek Zhaparov to Iran. Sides discussed prospects of cooperation. Iran expressed a wish to pour more than $1 billion into short-term projects in Kyrgyzstan and more than $10 billion into long-term projects. Besides, Mehdi Ghazanfari suggested resuming direct flight Bishkek-Tehran. According to him 30% of joint ventures in Kyrgyzstan is Kyrgyz-Iranian companies. “There are no any contradictions between our countries. After 2010 events Iran was the first who rendered humanitarian aid to Kyrgyzstan and allotted $1 million grant,” said Medetkan Sherimkulov. 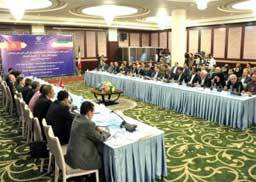 He noted there is an issue on allotting € 50 millions which is not being addressed for many years whereof 29 millions have to be allocated for Iranian businessmen in Kyrgyzstan, 21 million is suppliers’ credit for joint ventures. “This issue will be addressed at the session of the intergovernmental commission with participation of the Minister of Finance Akylbek Zhaparov on July 9-10,” explained Medetkan Sherimkulov.